Construction Law Seminar Series II – Together for Professional Practice. Ale conners might well have the most coveted job in London: they test the quality of new ales. 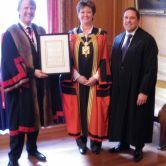 The job goes back to Roman times, but when the Corporation of London was established in the nineteenth century it was kept going as a specifically City tradition. 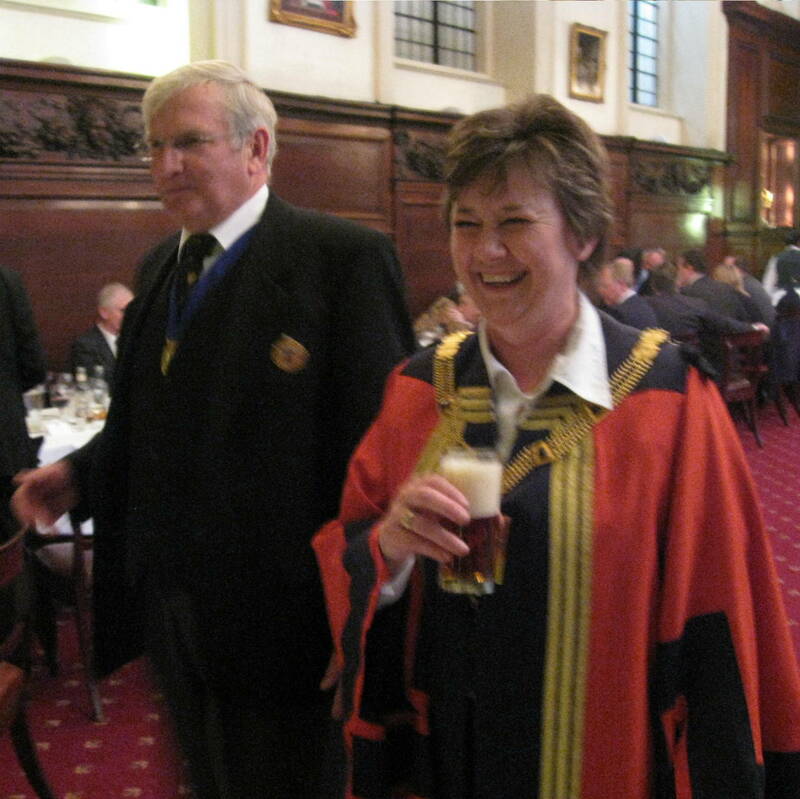 Today, four conners, including Christine Rigden, each test ales in the City two to three times a year – usually when a new pub opens, or when it puts on a new ale. 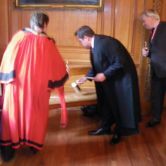 It’s a purely ritualistic process now, and has no legal bearing on the pub. In medieval times, they used to hang a sign outside the pub to advertise it if it was a new pub, or if a new ale had been brewed. 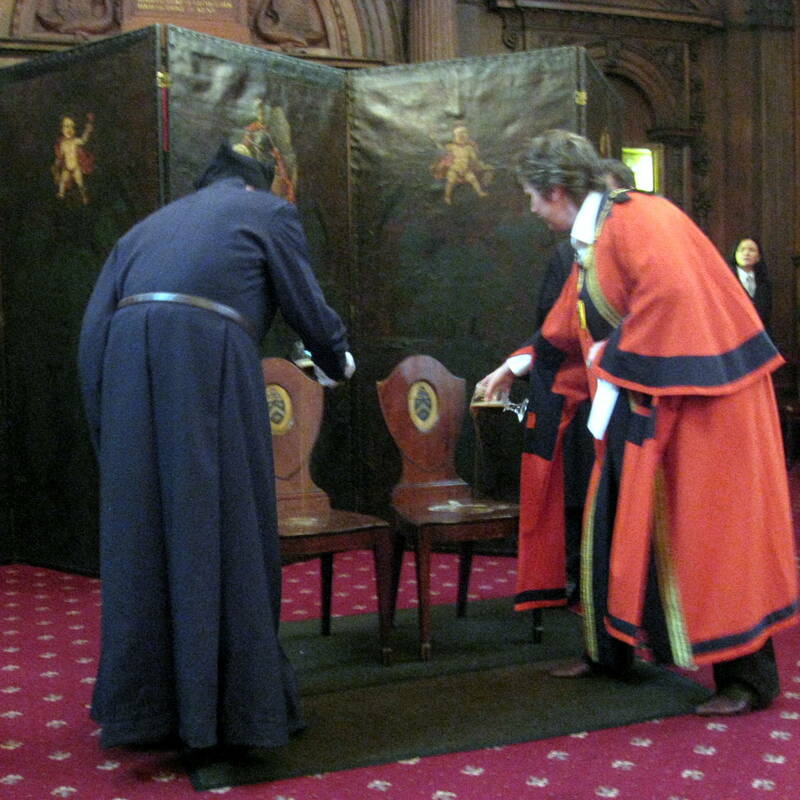 Then they’d call the conners to test the ale and check it was being served in the right measures. First Christine tastes the ales. 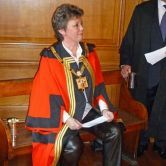 Then a pint of ale is poured on a wooden bench and she sits down on it in the leather breeches that she wears especially for the occasion. After one minute she stands up. 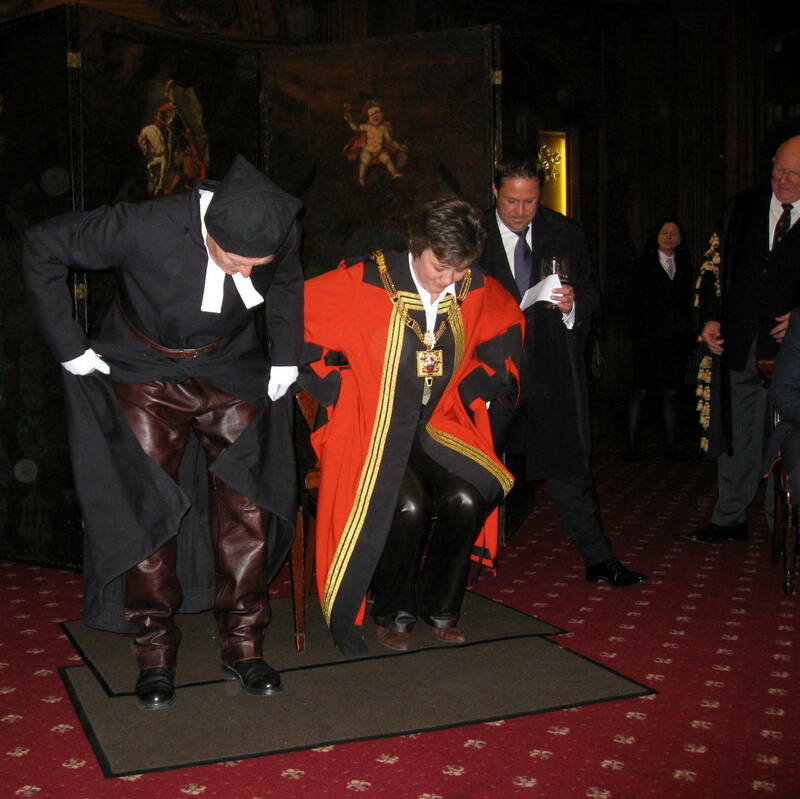 If ale does not stick to the breeches, it is not the right consistency. 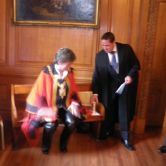 Afterwards she announces: “I proclaim this ale good quality. God save the Queen.” And everyone proceeds to get merry. No pub in recent times has failed the test yet. The Ale Conners do not get paid for services despite some interesting reports. First Christine tastes the ales. Then a pint of ale is poured on a wooden bench and she sits down on it in the leather breeches that she wears especially for the occasion. After one minute she stands up. If ale does not stick to the breeches, it is not the right consistency. 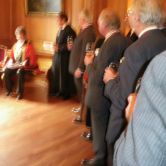 Here follows an "Ale Conning" with The Court of The Worshipful Company of Makers of Playing Cards. Yet another opportunity for Ale Conning!! Brewers' Hall, 7th January 2010 (The Master`s Birthday) "Happy Birthday Master!" 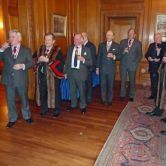 I was asked by the Master of the Worshipful Company of Makers of Playing Cards to carry out an Ale Conning following the Company's Court meeting at Brewers' Hall on 7th January. The Master, Brian Porritt, had arranged for the MD of Hook Norton Brewery, Oxfordshire [the only remaining brewery in the UK which runs using a steam engine] to give a tutored ale tasting of some of their bottled ales. The Master has developed a fondness for Hook Norton ales whilst an undergraduate at Oxford. 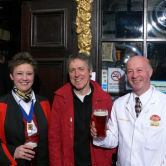 Unfortunately, the brewer was snowed in in Oxfordshire and was unable to attend. Luckily, the Master had sufficient stocks of a range of Hook Norton ales for the tasting to continue. On introducing me, as I was celebrating my birthday that, I was treated to a rousing rendition of "Happy Birthday to You" by the Court. 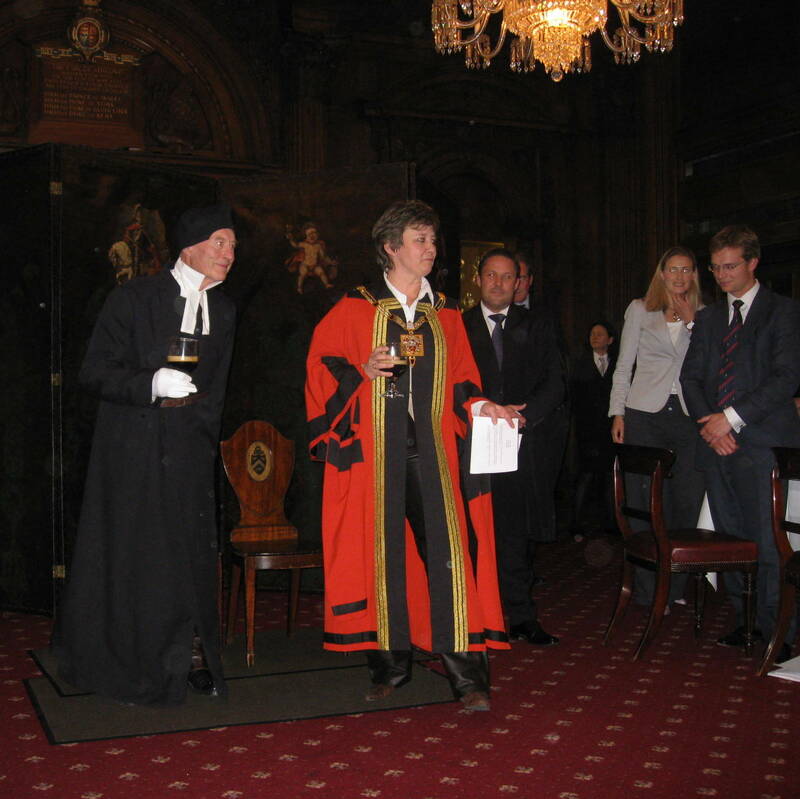 I carried out the Ale Conning along with the newly elected Ale Conner Dean Fisher, who is on the staff of the Remembrancer's office at Guildhall. 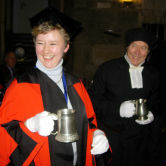 Dean carried out the role of "Master of Ceremonies" whilst I tested the ale by sitting in it wearing my leather breeches. The ale we "conned" was Old Hooky. It passed the very stringent Ale Conners' test, although it was definitely the stickiest I have tested to date. 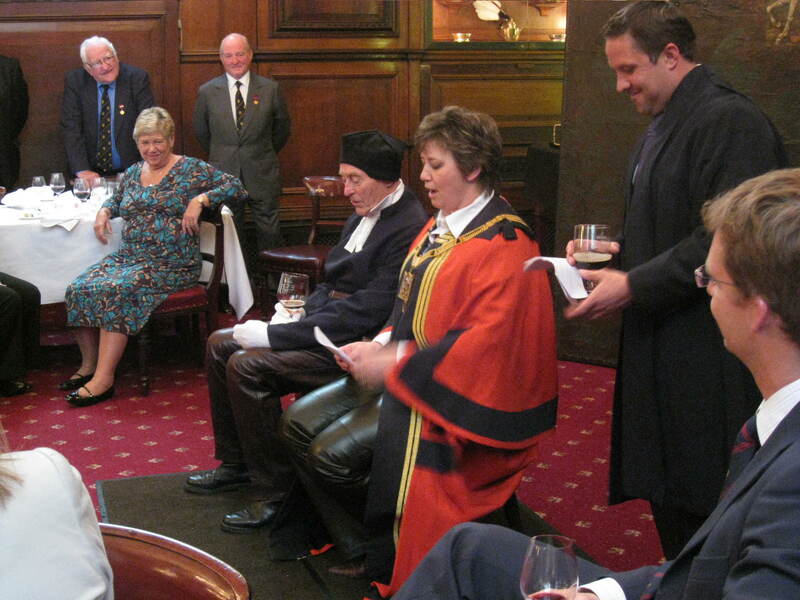 Following the test we presented the Master, in the absence of the brewer, with a certificate declaring the Old Hooky fit to drink by the good citizens of the City of London. On completion of the Ale Conning, and after changing my now pretty damp leather trousers, we enjoyed lunch. Unfortunately, the numbers attending lunch were reduced by a half as a result of the appalling weather. However, lunch and the company were both most enjoyable, and my fellow Ale Conner and myself were both presented with a very handsome twin pack of playing cards by the Master. 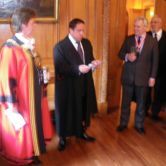 Each Master of the Makers of Playing Cards designs and has produced such a set for his year in office commemorating an event of that year; Brian Porritt chose the 800th anniversary of London Bridge. The Master's photograph appears on the ace of spades, and that of his lady on the ace of hearts. 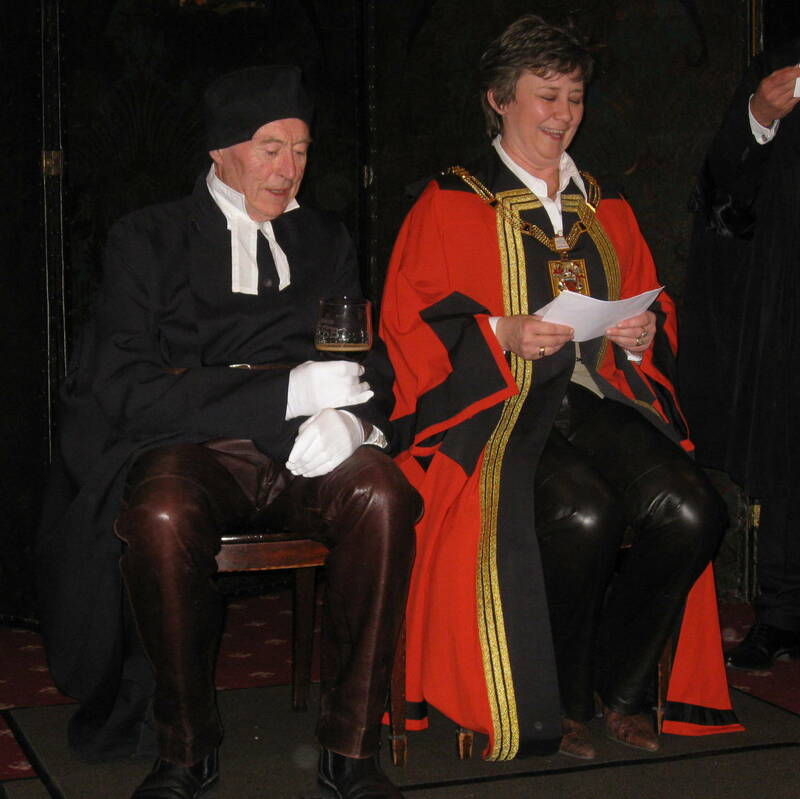 Christine in her leather breeches and MASTERS Gown! sits in the beer. She waits sitting in the beer for a reaction between cold wooden bench, fine Ale and warm leather trousers. After a minute she stands and comes free from the bench wherein she proclaims the Ale approved. A certificate of approval is issued and everyone drinks whatever brew the brewer has provided for the testing!